Today is the last #MichaelMyersMonday of 2016, and with it we look ahead to one of our most anticipated collectible releases coming in 2017, with a gallery of fresh photos of the new Michael Myers 12-inch figure inspired by Halloween: The Curse of Michael Myers coming in early 2017 from ThreeZero! 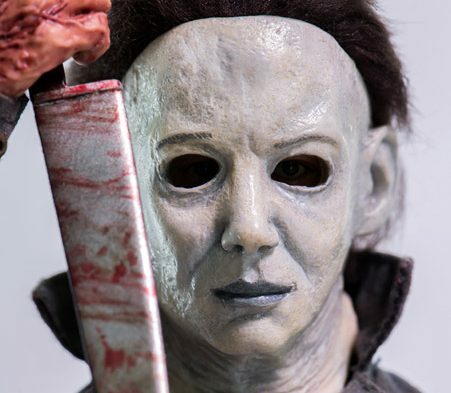 The new 1/6 scale Myers figure was first teased on their Facebook page back in October, revealing a tight first look in a killer recreation of the 1995 film’s original theatrical poster, but now ThreeZero is taking pre-orders and has released a ton of new, detailed images. The 12.5-inch tall articulated figure features tailored clothing, rooted hair, a clean knife and a bloody knife, and exchangeable hands with one pair of relaxed and one pair in a grip for holding the knife. The new Halloween 6 Michael Myers figure from ThreeZero will be released in early November 2017, priced at $150. Check out a photo gallery of images of the new figure below, and then you can pre-order yours here!